Zalig Kerstfeest! Or rather, Merry Christmas to you from Holland, our second destination in our Christmas Around the World Series. On December 5, Dutch children await a visit from the religiously clad Sinter Klaas riding his white horse. In harbor towns, Sinter Klaas will actually sail in to the harbor, with children waiting to welcome him. 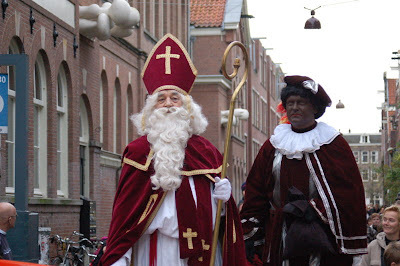 With Sinter Klaas is the stern-faced Black Pete , ready to punish the naughty little children. He looks a little like an Oompah Loompah gone bad. (I think perhaps American children would be less scared of Santa Claus if we gave him a stern companion. As it is, children have every right to be scared to sit on the lap of an old man that knows their every wayward deed and is willing to dole out coal accordingly.) On December 5th, little ones in Holland (and other Western European countries) leave out shoes filled with carrots and hay for Sinter's noble steed. In the morning, they hope their horsey offerings will be replaced with candy and little surprises. The two charges are exceedingly grateful that Sinter Klaas goes out of his way to visit the American little children who remember to leave out their shoes as well. It's so much easier for me to resist candy once it's been inside someone's shoe. No temptation there. I do know one just one Christmas song in Dutch, and I'll bet you do too. Remember that little scene from Miracle on 34th street when a orpaned girl from Rotterdam insists that Santa Claus really would be able to speak to her in her native tongue? And then lo and behold, in one of the most tear-jerking moments in all of filmdom, the two of them sing something that sounds like"Sinter Klaass kapooncha ka, heifa den mine shooon sha." Help me witht the slaughtered spelling readers, but in the meantime you get the idea. That little Dutch ditty comes in handy, too. I sang it to a little Dutch girl that I met in France this fall. Only because I don't know how to say anything else in Dutch. I'm sure even at age 5 she recognized that I might be cuckoo; I suspect she was right. And last but not least, a Dutch soup recipe to aid in your world-wide celebration. This one is a belly-warming quickie, cheap and scrumptious. Don't skip the bread and cheese-it really makes it special. And for a fun Dutch Christmas tradition, place a chocolate initial (piped from a ziptop baggie) on each person's side plate. When I taught school, I simply squirted each student's initials with Hershey's syrup on waxed paper and let them lap it up with pretzels. No one ever complained. But if I have time, I prefer to use real chocolate. Now on to the soup! Check the price of bagged cauliflower compared to whole cauliflower and buy the best deal. It won't take much time to cut up a whole head. Look for canned broth to be on sale during the holidays and stock up. Otherwise, you can you use homemade broth if you're lucky enough to have it, or bouillion cubes. Hit up the bakery for day old baguette, since you're going to toast it anyway. In a large stock pot, melt butter over medium heat. Add onion, potatoes, cauliflower, and carrots. Saute until golden brown. Add broth, cover and simmer for 15 minute or until vegetables are tender. Meanwhile, toast bread on both sides under broiler. Cover toasted bread with cheese and toast until melted. To serve, give soup a squeeze of lemon and divide between bowls. Float bread slices over soup and garnish with scallions, if desired. The traditions and the soup are wonderful. I'd like to start a few more with the grand daughters. Shelby loved the Nutcracker last night. We had a wonderful time and then she spent the night with us and we took her to church this morning. It was the best part of the whole weekend. so much fun getting candy in shoes! only kids would love it! The soup looks nice & hearty! I am loving your Christmas tradition info and recipes! I am trying to have get Swiss, Danish, and Welch traditions going in my fam with recipes and activities! Of course I have to add some German tradition in too! Goals for Emily's Christmas baking this year=Spekulati cookies, and Zimt-Sterne! We'll see if it happens! Love the Christmas info and soup! I really enjoyed learning more about Dutch Christmas Traditions Erin! this soup looks fabulous as well. I could really go for some of that! Soup looks comforting and yum. We do the German version . . . St. Nicholas Tag (day). Grant did his school project on it also. I'll bet you homeschoolers don't give out big project assignments that are due during such a busy month. Mommy's wouldn't do that to themselves. . ..right? :) The soup looks delicious! I'm loving your Christmas around the world. Thanks for sharing the traditions and food with us. I love hearing about all of the different traditions. The soup looks great!! I'm going to have to blame it on the pregnancy, BUT I must CONFESS that I ate the candy (sealed, and individually wrapped, of course) from my shoe. Ohhhh, the shame. And I must further confess it was 8am. Oh well, to make up for my unhealthy, piggy ways, I will have to make this delicious healthy soup. Thankyou for sharing all of these wonderful tradtions and recipes. We have been having a wonderful time celebrating Christmas around the world. Tonight we make gingerbread houses, can't wait. This soup looks splendid. I can't wait to give it a try! I love those traditions! They look so fun. I can't wait for the next one. And the soup is supberb, as always! I'm so glad you liked Priscilla and all the new stories. You should have gotten some sleep instead of getting up to read them all! You are so right -- what Santa Claus really needs is a bad cop. And I think you are onto something with the whole "put candy in shoes so that it loses its temptation" concept. I might have to try that with cookies, pizza, leftover enchiladas, etc. I am loving this series, Prudy -- and the soup looks fantastic! I'm enjoying the Christmas around the world tour the soup looks warm indeed! I haven't ever heard of this soup from my dad. I wonder if he ever had it when he was there. Maybe I will make it and surprise him when I tell him where it originates! Your soup looks wonderful! Thanks for the background information on Holland -- very interesting! I'm so excited to see what other countries you cover -- can't wait! I wish I got treats in my shoes. The soup looks really tasty - perfect for the cold rainy day today in Oregon. OK, my mum's Dutch and I knew about Sinter Klaas and Black Pete, but really, I *must* talk to my mum about the treats in shoes thing! Why did I never know of this?? :) It's such a cute idea, though I suspect children would be wanting to put out grown up shoes in place of their own petite versions;) That's MY kinda soup too! Aw wow - this looks great and I love the idea to go around the world like this! I think I like getting my treats in a stocking instead of a shoe! The soup sounds so delicious! That Black Pete does look like a scary oompa loompa! That soup looks like pure comfort food, though :). Hope you're doing well! 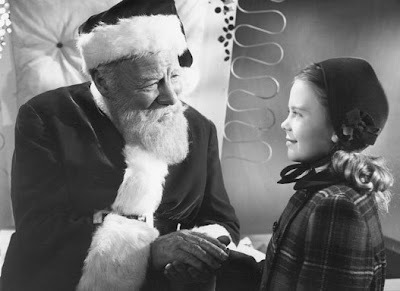 Miracle on 34th street is one of my favorite movies and I just about cry every time I see the scene with the adopted Dutch girl and Santa! Cheaper than canned or boxed broth and cheaper (and tastier) than bullion cubes is powdered bullion. The cheapest way to get it is in the big container from Walmart (they sell smaller ones there and smaller ones at the grocery store). It's by Knorr. It is not so salty like bullion cubes. You use one tsp per cup of water, and it dissolves very quickly. Hey: that shoe tradition is muy European, since my Prussian mom and Slovak dad did the same thing when they were little, but Dad's family left a bowl of soup for St. Nick. Since I CANNOT resist even shoe-wrapped chocolate, St. Nick leaves my kids an ornament to put on our tree which goes up a week later. Those cinnamon rolls are awesome, and if you have been blessed with the Lx gene (for laziness) like me, you can use puff pastry from the fridge section, (a la Pillsbury dough boy).